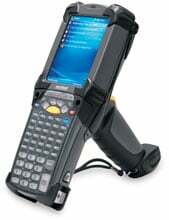 Symbol MC9090-G - Wi-Fi (802.11a/b/g), DPM Imager, Windows Mobile 5.0, 64MB RAM/128MB ROM, 53 key, Bluetooth. GREAT PRODUCT FOR THE PRICE! IT IS EASY TO USE AND DEPENDABLE. DURABLE CONSTRUCTION CAN WITHSTAND A REASONABLE AMOUNT OF ABUSE. WE HAVE USED IT FOR 8 MONTHS IN OUR WAREHOUSE CONNECTED TO OUR WIFI. ONLY HAD TO REBOOT IT TWICE IN THE WHOLE TIME. The Symbol MC9090-GW0HJEFA6WR is also known as Symbol Technologies	SYM-MC9090GW0HJEFA6R	or MC9090GW0HJEFA6WR	.